I now have three female dwarf gouramis in a 2.5 gallon Aqueon Bow Tank. This tank comes with a small mechanical filter designed for a small cartridge containing activated carbon (I presume). The cartridge sits on a small tray 3 3/4" x 2 1/2" just below the removable top. The unit also has 2 white LEDs mounted in the top. I relocated these over the filter tray, taped a foam baffle to the side of the tray to block the light from the rest of the tank. I put a thin scrub pad cut to size in the tray and over that a piece of plastic sewing canvas roughed on both sides. Since the dwarf gouramis are very sensitive to Nitrites and Nitrates (not to mention the Ammonia! ), I added Prime and will continue until the params settle down. It will be interesting to see if the little algae scrubber can maintain the Nitrates. I doubt it, but maybe I'll be surprised. Some gravel would help with ammonia too. This is a 2 1/2 gallon tank and I've been changing about 1-1 1/2 gallons daily. As you can see from the Apr01 test, nitrates rose. So starting yesterday I am changing 1-1 1/2 gallons twice daily to keep nitrates under 5.0ppm. These dwarf gouramis are particularly sensitive to nitrates. Algae is growing very well in the top filter pan and it's also growing on the side of the aquarium behind the sponge filter and on the back of the filter where the light is located. I am hoping the algae on the back will go away if I maintain very low nitrates. So I'll see how well the algae in the filter does against the algae growing on the back wall. I may also pull out the sponge filter to eliminate generating nitrates from that. Since I'll be changing so much water every day there doesn't seem much point in bio filter. I ran the algae scrubber lights 24/7 for a couple of weeks and the algae turned black. So about a week ago I started turning off the lights for about 8 hours per day and green algae returned. The algae growing behind the sponge filter is both green and brown. The pH of my source water is about 6.6 (as per the Mar08 test), so I'm hoping that the pH 6.0 yesterday was due to the nitrates and the trace of ammonia. I don't want to adjust pH in this tank if I can avoid it. So I'm going to test pH daily for a week or so to make sure it stays up with the water changes. I pulled the sponge filter today, cleaned off all the algae growing on the back and changed about 60% of the water. I also added an airstone where the sponge filter was. pH is now 6.6. Later tonight, and then again tomorrow morning, I'll change another gallon of water. At that point I will measure nitrate. Hopefully, it will be undetectable. Once nitrate is undetectable I will cover the back light with a translucent filter, I'm thinking green or yellow, so the light entering through the back of the aquarium is not very conducive for algae growth. Or maybe some other colour would be better? Any suggestions? With no sponge to generate nitrates, the algae in the scrubber will be forced to eat ammonia; at least that's the theory. So I'll be changing 50% of the water twice a day and measuring both ammonia and nitrates daily for a few days to see what happens. If the algae continues to grow in the scrubber (but NOT on the back glass!) and ammonia and nitrate remain undetectable, then I will conclude the theory is correct. Then I will back off the water changes to once per day to determine if ammonia remains undetectable. This is a very small aquarium with three dwarf gouramis. They eat a lot for their size so it will be interesting to see what happens over the next week or so. This is the first 'proof of concept' experiment for another scrubber idea I have. You would want to use a green colored filter, to remove reds and blues. Thanks! There is still detectable nitrate (0.0+) so another day or two of water changes to reduce it. There was also detectable ammonia (0.25). With the pH holding steady at 6.6 I don't think the ammonia is a problem yet. Nonetheless, I added Prime just to make sure. I want to see when/if the algae starts to reduce it. At some concentration, the 2x50% daily water changes should stabilize it. I cleaned the 'mini-scrubber' screen quite thoroughly yesterday. Already new bright green algae is starting to grow! In the photo the green outlined by the screen openings is the green cleaning pad (which unfortunately happens to be the exact same shade of green as the new algae!) below the scrubber screen, so the new algae is visible on top of the screen in several places. I guess I could have used a different coloured filter pad! Maybe there are some blue ones. Nitrate went to 0.0 today! After pulling the sponge filter on Apr03 ammonia went up to 0.25 (as indicated in my previous post) for a couple of days. Today it went down a little to < 0.25. Green algae started to grow again on the back glass next to the light source, so I bought a pale green coloured plastic table cover, cut a piece to fit around the sides and back of the aquarium and taped it in place. I was SEVERELY tempted to remove the algae, but resisted! 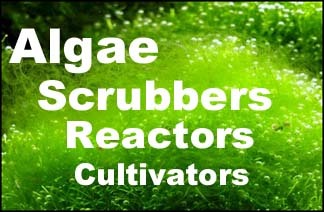 I want to see if the algae in the scrubber will outcompete for nutrients which are now ammonia only. I'm thinking the plastic is a little too thin and lets through a a little too much light. So if the algae keeps growing on the back instead of going away I'll add a second layer of plastic on the back. Oh! I replaced the pad under the scrubber screen with a much darker green pad, so the algae growing on top should show up better on photos.